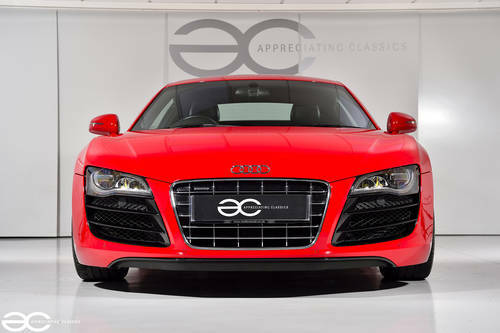 An increasingly sought after, Audi R8 V10 with manual transmission. Touted as one of the last true manual transmission supercars, these are hotly tipped as a great future investment – whilst still being useable and a total joy to drive. 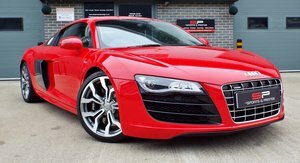 All the usual R8 V10 specification is present of course, such as the full LED headlamps, Bang & Olufsen 465 watt audio system, Sat Nav, Rear camera & parking sensors front & rear, Audi Magnetic ride suspension and so on…. but also you will notice further options were added at point of order, such as the gorgeous carbon interior pack, carbon side blades and carbon engine bay trim. 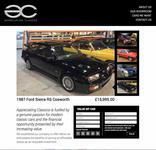 So what we have here is a very well spec’d car, which is an absolute pleasure to drive, and is a potential investment which you can enjoy! As mentioned above, the car comes with all the original booklets, in original binder. 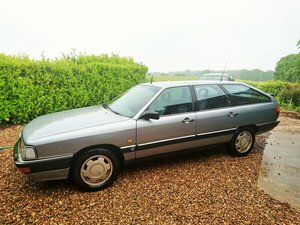 As well as this, it has the R8 brochure within the history file, original un-used spare key & skeleton key. 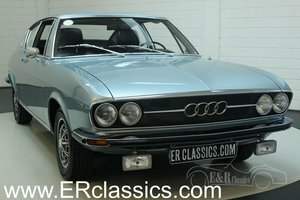 The Audi service history is stamped within the original service booklet, and various invoices from Audi are also present. MOT history is also within the file, as detailed below. 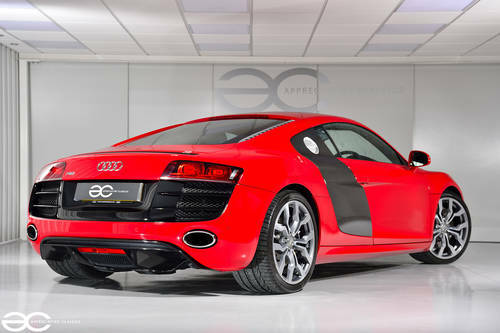 Finished in ‘Brilliant Red’, this R8 stands out from the crowd. The car has benefited from a machine polish in recent months, and looks great. The carbon blades are in very good condition and break up the red paintwork perfectly. Some stone chips are present to the front of the car, which are as you would expect for the mileage, on a low slung supercar. All glass appears to be original, and all badges are in good condition. Like wise all lights are in good condition, with the full LED headlights looking superb. All wheels present very well indeed, with just a small mark apparent on two of them, these are small and do not detract from the car. Open the door of this R8, and the first thing you notice is the R8 illuminated treadplates. 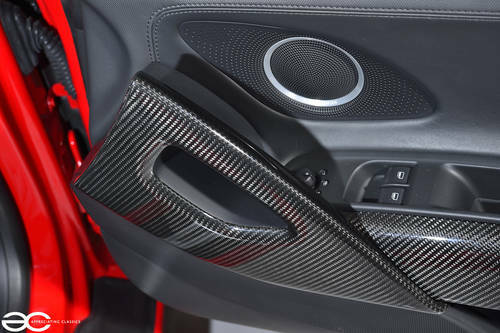 Secondly you notice the stunning carbon fibre trim, which graces door cards, instrument cluster and centre console. 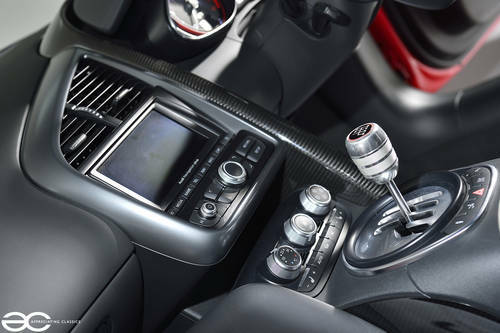 Of course, this optional carbon interior trim is in superb condition and sets this apart from the majority of R8’s. Once inside, the instrument cluster is easy to read, the seats operate electrically at the touch of a button…this is a long way from your typical 80’s or 90’s supercar – it is user friendly and comfortable. Satelite navigation, parking sensors with camera, heated electric seats, Bang & Olufsen audio system, phone connectivity… this is a car you would happily use for a road trip. All of this, yet it still manages to have the special supercar feel about it, reminding you that you are driving something very special. Of course everything operates just as it should do, and the entire interior presents extremely well indeed. The 5.2L V10 which was taken from the Lamborghini Gallardo – albeit with a few minor changes. Almost 520bhp is on tap, and as you can imagine, this makes for great performance. A top speed of very close to 200mph, and a 0-60mph time under 4.0 seconds, this is still a very fast car today. Having said this, the R8 is happy to be cruising around at city speeds, and is effortless either in heavy traffic, or on the open road. The 5.2L V10 is a proven engine unit, with great reliability and superb performance. Not only that, but it provides a great soundtrack. This example runs just as it should do, with smooth performance throughout the rev range. No unwanted engine management lights of course, and regular servicing has been carried – showing that the car has been cared for by enthusiast owners. If you have ever wondered – is the R8 V10 all hype, we can confirm that the hype is real and they really are a superb all round supercar. As you would expect, this car drives very well. The car has four matching premium tyre’s fitted, all with good tread remaining. Wheel alignment was carried out in recent months, and the car drives straight and true. Braking performance is very impressive, and effortless. The manual transmission is an absolute joy to use, with a user friendly clutch, and precise gear change through the beautiful gated shifter which makes the classic ‘clack clack’ noise with each gear change. The Audi Magnetic ride suspension works really well, helping to give smooth, predictable and impressive handling. 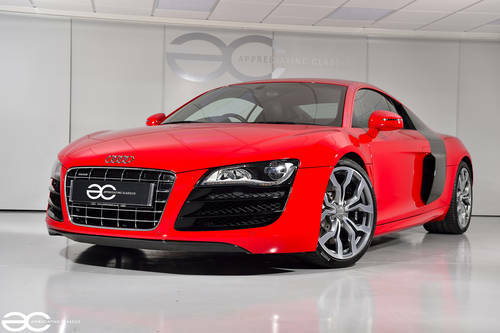 2012 AUDI R8 SPYDER 5.2 V10 QUATTRO, STUNNING!